DEARBORN, MI--(Marketwired - Mar 18, 2014) - AUTOMOTIVE WORLD MEGATRENDS USA -- Green Hills Software, the largest independent vendor of embedded software solutions, today announced that the latest release of its MULTI® toolchain has been certified to meet the highest levels of tool qualification specified in the IEC 61508:2010 (Industrial), EN 50128:2011 (Railway) and ISO 26262:2011 (Automotive) functional safety standards. Building on its prior certifications for MULTI, Green Hills Software has received certificates from both TÜV NORD and exida, keeping the Green Hills MULTI IDE as the only commercially available toolchain certified to the stringent SIL 4 (Safety Integrity Level) and ASIL D (Automotive Safety Integrity Level) tool qualification requirements. 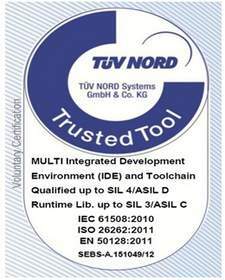 Included in the certification are the Trusted Tools mark from both TÜV NORD and exida. Green Hills Software is the world's leading supplier of safety- and security-certified software products and services for the embedded and mobile marketplace. For more than 30 years, Green Hills Software has helped clients solve the most difficult design challenges by delivering unmatched knowledge, cross-industry expertise, and a proven SIL/ASIL-qualified product portfolio to the growing number of markets requiring functional safety. Developers rely on Green Hills Software's decades of cross-industry safety and certification experience by leveraging its certified tools to build and debug embedded software that is certifiable to SIL 4 and ASIL D. Green Hills Software continues its significant investment to maintain functional safety qualification for the latest product releases. "Green Hills Software's safety expertise and portfolio of safety-certified products is unparalleled in the embedded industry," commented Dan O'Dowd, founder and chief executive officer of Green Hills Software. "These latest certifications confirm our long-term commitment to providing solutions and services that help our customers solve the most difficult design challenges when building high reliability products." "TÜV NORD as an independent accredited certification body has qualified Green Hills Software's latest MULTI toolchain release along the IEC 61508, ISO 26262 and EN 50128 standards and is pleased to build on its successful, long term customer relations with Green Hills Software to this broad set of functional safety standards," stated Gerhard Rieger, branch manager, TÜV NORD Systems GmbH & Co. KG. "Our certification efforts and end results with Green Hills Software for its MULTI tools provide these markets with the industry's first commercial off-the-shelf offering addressing the challenging requirements for a broad set of target microprocessors." "exida applauds Green Hills Software's continued efforts to deliver certified solutions and services as it updates its product portfolio," commented Dr. William M. Goble, director of exida Certification. "With this, Green Hills continues to lead the embedded industry when it comes to products and know-how addressing functional safety requirements across the broadest set of standards." The MULTI integrated development environment (IDE) leverages 30 years of embedded software development expertise to provide developers an integrated package of tools they can rely on to create reliable software efficiently. The MULTI IDE offers integrated multicore development, debug and programming tools, including AUTOSAR operating system awareness, flash programming for on-chip flash, performance profiler, project builder, code coverage, run-time error checking, MISRA C adherence wizard, and the DoubleCheck™ integrated static code analyzer. 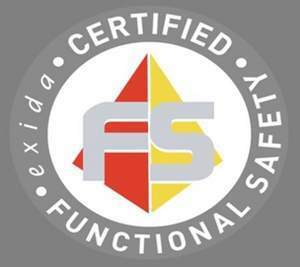 Safety Qualification for the latest release of the MULTI toolchain is available today.